Attendees have their own reasons for coming to your event. Make them feel like your event is tailor-made for their unique needs with our flexible platform. Easily create and manage meaningful, relevant events that have lasting impact for every attendee. Personalize the attendee experience to deepen engagement and inspire meaningful connections. A complete set of tools to maintain control in your event app and optimize your event. One event app platform for all your activities, whether it’s one or hundreds of them. We designed our platform to fit the way you work, with an easy to manage dashboard and real time updates all in a friendly user interface. From schedules and room locations to speakers and countless other details, things can change on a dime in the world of events. You have plenty of tools at your disposal to instantly updates, remove content and push messages. We’re enterprise-minded. We’ve built the Summit App Platform to support thousands of highly-personalized interactions across multiple events, entirely through a single platform. We understand that privacy and confidentiality are of vital importance. Our enterprise-grade backend and app-level security protect the integrity of sensitive user data and content across your entire meeting and event ecosystem. Every gathering – internal or external – is a brand experience. 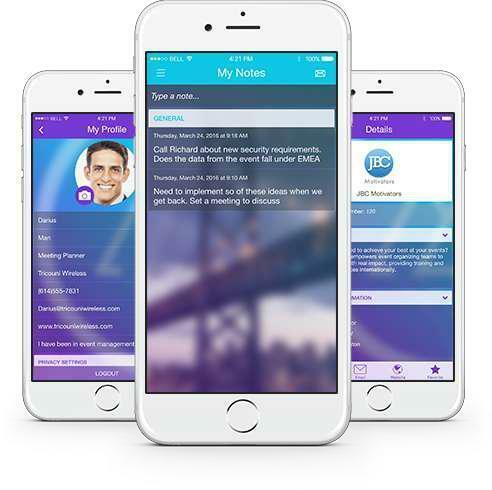 Stay true with a multi-event app that maintains and enforces brand consistency across all of your organization’s meetings, events, and conferences. Your event app is a breeze to manage thanks to the Summit App Platform, a web-based configuration and content management system that’s as easy to use as your smartphone. You control all the components and content of your app, so your attendees are always up-to-date and in-the-loop.